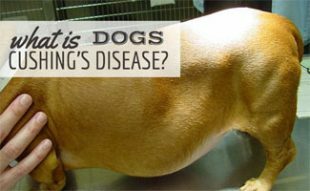 Home > Dog Health > Illness > What Are The Signs Of Cancer In Dogs? My wife and I have a dog, and I know the last thing in the world she wants to think about is our pup ever getting cancer. The thought of it can be so upsetting to us that we can blind ourselves and look the other way when it comes to our dogs’ health. Sometimes the warning signs are obvious – like large growths on the outside of their bodies. Other times, cancers can show up in unexpected ways. The best thing we can do for our dogs (and ourselves) is to mentally prepare for the possibility of trouble, so we can be proactive at the first sign of cancer in our dogs. 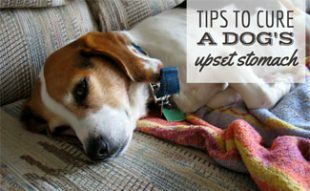 Because our dogs can’t tell us what aches and what is irritating them, we have to watch for any odd behaviors or strange sensitivities. We have to make sure that we keep a watchful eye on the things they do every day and try to pick out what seems unusual. More often than not, we have premonitions about when something is bothering our pets, and a lot of times we are right. What Are The Physical Signs Of Cancer In Dogs? Large Growths – Large growths, like tumors, can begin to form and should be checked out immediately. Take your dog to your vet and have him examined as quickly as possible. Smaller Lumps Under the Skin – Sometimes lumps can develop with age in our pets. You should not be concerned with any small bump under the skin, but monitor it. If it gets bigger, take him to your vet for a check. Also, if you notice any discharge or bleeding from that area, seek medical attention. 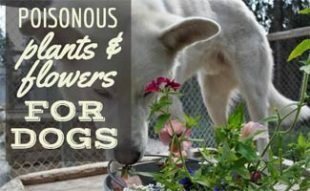 Odors – Dogs do some pretty gross things normally that will cause odors, but if you start to smell something unusual regularly, it could be an early sign of a problem. These new smells can sometimes come from tumors that could be cancerous. Weight Loss – Weight loss over the course of a few months is often a sign of cancer cachexia. Dogs will lose fat and muscle at an equal rate, even if they are eating a normal amount of food. What Are The Emotional Signs Of Cancer In Dogs? Loss of Appetite – Though there can be many reasons your dog might not eat, one of them could be cancer. When you notice a loss of appetite, the first step should be to change your dog’s food. Bland meals like chicken and white rice will often get your dog eating again. If your dog shows a lack of appetite over an extended period of time, it might be wise to get him checked out. Lethargy – Since dogs can’t tell us when something is bothering them, they do a great job of showing us. Many times, those signs will show up as lack of energy, despondence and an inability to get excited about things that usually make them happy. 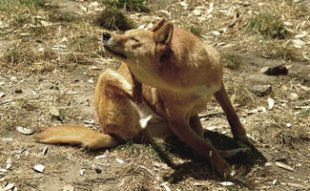 Where Should I Look For Dog Skin Cancer? Because our dogs are covered in hair, we sometimes forget that they can still be susceptible to different types of skin cancers. However, skin tumors are very prominent in dogs and should be examined immediately when they are first found. While we might think that our dogs are protected, we forget about areas like their noses and the pads on their feet. These areas are extremely sensitive and vulnerable to sun poisoning. Skin cancers in dogs include melanoma, which shows up as lumps on the skin or around their mouths, squamous cell cancer and mast cell tumors. Mast cell tumors are the most common skin tumor in dogs and there is no known way to prevent this type of cancer. What Treatment Is Available For Cancer In Dogs? 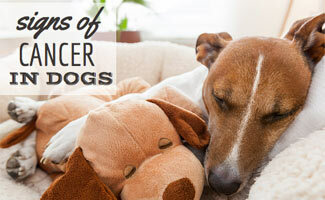 There are many dog cancer symptoms that have been mentioned already. Abnormalities in behavior or sudden growths under the skin or around the mouth and eyes are easily detectable signs of cancer in dogs. Be proactive and give your dog regular checks to make sure he is happy and healthy. When you’re petting him, feel for spots and monitor anything that seems unusual. If your dog has cancer, there are things you can do. Talk to your vet, as every case is specific to the breed and current health of your dog. There are high-protein foods you can give your pup to help him battle weight loss, as well as medications that can help treat the minor forms of cancer to keep it from spreading. In severe cases, surgery can remove cancer completely from your dog, but make sure you talk to your vet so you understand the risks of such procedures. Finally, treating cancer in dogs can be cost prohibitive. Pet insurance can help defray this cost. If your dog is uninsured, you might consider pet insurance so that if (God forbid!) your dog does get cancer you will be financially able to help him battle this horrible disease. Do you know of other signs of cancer in dogs? I’m so sorry for your loss, Tristan. My oldest dog who is 15 has cancer and I’m scared that I’m going to come home and him already gone. Well, me and a friend who also has a dog. When she had a pretty scary moment that something was really wrong with him, her husband had to call the vet and they told him to take him to the emergency hospital for dogs because he had a movement and was throwing up , and was very lethargic that morning. So ever since I thought about how I can get more medical services without the hefty fees out of pocket for my dog to get to stay or get healthy. I just don’t always have the money to get him the care he needs. Fella is a real lovable gentle giant. I just don’t know what I would do. Well throwing up is a sign of cancer and my dog has the same thing so I think I can help you.